(from Poetry International) Born in Cape Town, South Africa, Cecil Helman qualified as a medical doctor before moving to London to study social anthropology. Over the years, he has managed to combine his writing career with 27 years as a family doctor for the National Health Service and academic posts in London and abroad. He is a recognised expert on medical anthropology, specialising in the cross-cultural issues involved in illness and medical (and other forms of health-) care. He writes fiction, non-fiction, prose poetry, essays and academic texts. Helman’s interest in the prose poem arises naturally with the synthesis of his cross-cultural research. In his use of the genre, he draws out its echoes of traditional myths, tales and legends that persist in even the most advanced societies. 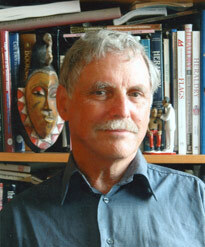 Cecil Helman’s poetry has appeared in many literary journals and anthologies in the UK, the USA and South Africa. His recent memoir, Suburban Shaman: Tales from medicine’s frontline was BBC Book of the Week and serialised on BBC Radio 4 in March 2006. That UFO that came down that day. The one that picked on us, just us. Circular and silver, that almost whitening-grey and glistening one. Why us? The one that set fire to the cowshed, and did those mathematical things to the chickens, God rest their little souls. But why to us? Why then? Do you remember it, that so-called UFO? The one that divided Uncle Basil, and subtracted Aunty May? That silvery thing, silver-blue as a circular whale that swam, just like that, through the air. At great speed, just like this, look, just like that. But why us? Remember that UFO, remember that high electrostatic whine, and the aurora borealis that fell across the farm. The shadows in the fields. The old crops whitening. The shriek of radio, and all that fearful television. The pylons that ran in panic across the yard, trailing their wires behind them. The tractors that fought each other to death, inside the incubators. All those llamas then, and the wild rabbits, and the melted generator. All dead and gone, all of them, now. Even the fax machines, dead in their corral, among the crispy remains of xerox and thyme. Do you remember that alleged UFO that landed among us that day? The one that took me so far away, and never brought all of me back again?